Across the globe, the importance of young people and their involvement in a sustainable future is both evident and indispensable. People under 30 now make up the majority of the world’s population. About 600 million of these young people live in areas affected by conflict and instability. Last year, the United Nations Security Council adopted Resolution 2250, focusing on the role of young men and women in peacebuilding and providing alternatives to violent extremism. The resolution calls for including young people in decision-making at local, national and international levels and increasing support for peacebuilding efforts by youth. It is easy to become frustrated and despair when violence and its many outcomes are perpetuated despite the best efforts, resources, investments, energies and sacrifices made by donors, international and local non-governmental organizations and individual stakeholders. Nurturing the hearts of young people for peace will lead to making peace an attitude that is lived and a moral code that guides society towards just peace. Nigeria witnessed radicalized ethnic and religious violence, even before the advent of Boko Haram, due to conflicts around politics and governance, resource control and livelihoods. These have led to reprisal attacks and a cycle of violence in which young people are used by the main actors as instruments for the destruction of lives and property. Biased narratives are transferred to younger generations, resulting in animosity, unforgiveness and disregard for human life and dignity. This is particularly true in Nigeria’s Plateau State, where ethnicity has been used as a tool in politics and governance. Worship places have been desecrated, while meaningless killings occur and the Boko Haram insurgency has taken root. Though the U.S. is greatly committed to global development, it has extensively supported military actions against Boko Haram. This militarized approach to countering violent extremism does not provide a longer-term vision for non-violent peacemaking, peacebuilding and just peace as desired. It also does not help youth to see how they can live together with one another while making efforts to attain sustainable development and just peace. In order to transform the mindsets of young people, break the cycle of violence and reduce the involvement of youth in ethno-religious conflicts, peace clubs have been established in schools by Emergency Preparedness and Response Team (EPRT), an organization that receives support from Mennonite Central Committee. MCC currently supports 34 of its peace clubs. 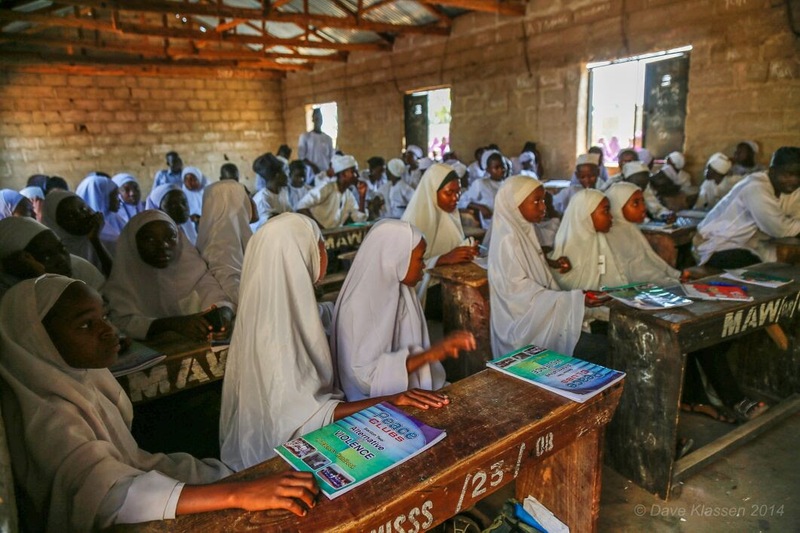 This paradigm shift to peacebuilding has reduced and transformed aggression, bitterness, distrust and bullying among schoolchildren of different religious beliefs and ethnicities, assisting school systems in Plateau State to grow ethical leadership and improved societal and family values. These efforts help nurture young hearts for peace, cultivate future leaders and instill respect for human dignity and creation. Charles Kwuelum is Legislative Associate for International Affairs in the MCC U.S. Washington office. Story originally published on July 30, 2016. Reprinted with permission from PeaceSigns.